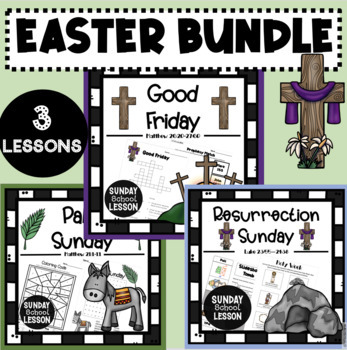 These three Sunday School Lessons walk students through the Triumphal Entry on Palm Sunday, Jesus' crucifixion on Good Friday, and His Resurrection. It was created to be used in a 2nd and 3rd grade class but can be adapted to grades 1-5. Each complete lesson includes additional activities such as crafts, review worksheets, and object lessons that help students better understand that Jesus died because of our sin and was raised from the dead in order to be in right standing before God.